Select the appropriate language for your project below and either scroll down or use the navigation menu on the left to learn about each API call. We also have other great resources on our GitHub page, such as our Twilio IVR Demo project, iOS SDK, Android SDK and Cordova Plugin. These resources allow you to save time by simply copying code segments into your new or existing project. VoiceIt's API is based on REST principles making it is easy to write and test applications. We have created these online documents to help you utilize the RESTful API calls in your preferred coding language. Please register with us in order to obtain a developer account for use in our Voiceprint Developer Portal (VPDP) RESTful API. Creates a new user profile record. UserId A unique alphanumeric identifier between 5-36 characters, that identifies a user in your database. Provided as part of the REST API Access Credentials. VsitPassword A SHA 256 encrypted token (not an actual end user password) that can be the same or unique for all user profiles. Provided as part of the REST API Access Credentials. VsitDeveloperId Assigned after registration and can be found under the Settings section of the developer console. Provided as part of the REST API Access Credentials. Deletes an existing user profile record. UserId The UserId used to create the user profile. Provided as part of the REST API Access Credentials. VsitPassword The same SHA 256 encrypted token used to create the user profile. Retrieves an existing user profile record. Creates a new enrollment template for the specified user profile. We require a minimum of three (3) enrollment templates per Voiceprint Phrase (VPP). To manage your VPPs associated with your developer account please log in and navigate to the Voiceprint Phrases section. You can also refer to this blog post to learn more about creating and managing your VPPs. Please Note: VPP's are Text-Dependent. The recording length of a VPP must be in between 1.3 to 5 seconds. You cannot use the same sound file for enrollment and authentication because of our anti-spoofing technology. ContentLanguage The content language of the VPP for use in Speech-To-Text (STT). To view a list of all supported languages, click here. Wav Data(Audio Bytes) The recommended codec is PCM (wav RIFF) with 44.1KHz to 8KHz sample rate, 1 or 2 Channels, 48 to 8 Bits. However, the following codecs are supported: 8svx aac alac aif aifc aiff aiffc al amb au avr cdda cdr cvs cvsd cvu dat dvms f32 f4 f64 f8 fssd gsm gsrt hcom htk ima ircam la lpc lpc10 lu maud mp2 mp3 nist prc raw s1 s16 s2 s24 s3 s32 s4 s8 sb sf sl sln smp snd sndr sndt sou sox sph sw txw u1 u16 u2 u24 u3 u32 u4 u8 ub ul uw vms voc vox wav wavpcm wve xa. Creates a new enrollment template for the specified user profile via a pre-recorded sound file. We require a minimum of three (3) enrollment templates per Voiceprint Phrase (VPP). VsitwavURL The fully qualified URL to the pre-recorded audio file. Codecs supported include mp3, mp2, wav, sln, u-law, and pcm. Deletes an existing enrollment template for the specified user profile. Enrollment Id The enrollment Id value is retrieved from the getEnrollment REST API call. It is not passed as a header, but appended to the url when making this api call. Retrieves the existing enrollment template(s) for the specified user profile. This REST API call is used to authenticate the specified user profile. Wav Data(Audio Bytes) The recommended codec is PCM (wav RIFF) with 44.1KHz to 8KHz sample rate, 1 or 2 Channels, 48 to 8 Bits. However, the following codecs are supported: 8svx aac alac aif aifc aiff aiffc al amb au avr cdda cdr cvs cvsd cvu dat dvms f32 f4 f64 f8 fssd gsm gsrt hcom htk ima ircam la lpc lpc10 lu maud mp2 mp3 nist prc raw s1 s16 s2 s24 s3 s32 s4 s8 sb sf sl sln smp snd sndr sndt sou sox sph sw txw u1 u16 u2 u24 u3 u32 u4 u8 ub ul uw vms voc vox wav wavpcm wve xa. This is a required parameter and cannot be null. Authenticates the specified user profile via a pre-recorded sound file. Please Note: The Voiceprint Phrase's (VPP's) are Text-Dependent. The Minimum length of a VPP is 1.2 second. Please note: You cannot use enrollment sound file for authentication. This is because of our anti- spoofing technology. WHAT ADVANTAGES DO VOICE BIOMETRICS HAVE OVER OTHER BIOMETRICS SYSTEMS? The main advantage that voice biometrics has over other biometrics is its ability to prevent spoofing in the case of a data leak. If your fingerprint or retina data were to be stolen, the biometric security would be compromised beyond repair; you cannot (easily) change your retina or fingerprint. However, because voice biometrics employs text-dependent characteristics, you can simply adopt a new voiceprint phrase and wipe out all previous enrollments in the case of a biometric data leak. Furthermore, in specific situations where fingerprints or retinal scans cannot be used (such as laboratories where gloves leave residue on fingers and gloves cannot be removed until one has exited the lab), voice biometrics possess added advantages. WHAT IF SOMEONE RECORDS MY VOICE? 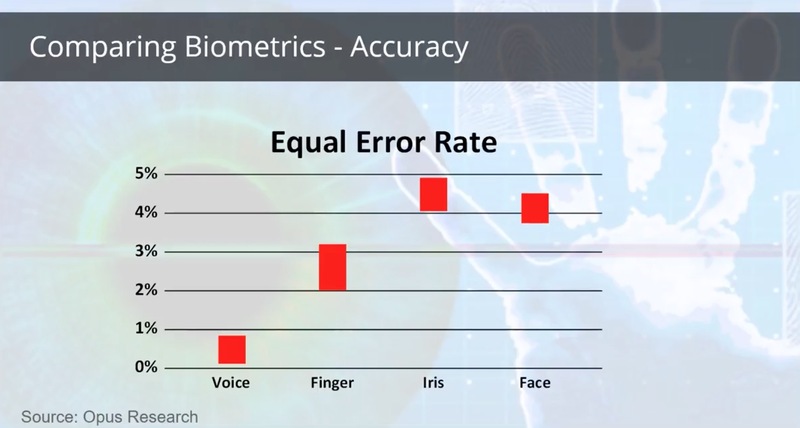 Our biometrics engines automatically reject any authentication that matches too closely with a previous recording, as there will always be subtle differences each time you speak. CAN I AUTHENTICATE IN ANY LANGUAGE? We support authentications in many languages. WHY DO I HAVE TO SAY AN APPROVED VOICEPRINT PHRASE? Contrary to popular belief, "My voice is my password," is an unsecured phrase. Due to repeating IPA phonetics (sounds) and length, it does not meet our security standards. Approved phrases contain enough data and IPA phonetics to allow for an accurate voiceprint. Phrases can be requested and managed under the Voiceprint Phrases section of the developer console. Requested phrases should have no repeating IPA phonetic and be a minimum of 8 syllables. WHAT MAKES A GOOD VOICEPRINT RECORDING? WHAT IF THERE IS A LOT OF BACKGROUND NOISE? VoiceIt incorporates noise-cancelling and voice detection technology for enrollment and authentication. WHAT IF I HAVE A COLD? Our biometrics engines intelligently enrolls certain successful authentications and tracks gradual changes in your voice over time. For some sudden changes, such as sickness, your voice may be too different to authenticate. However, this only happens in extreme cases. MY RECORDING WAS UNSUCCESSFUL. WHY? Your recording was too short or too long (must be at least 1.3 seconds long and no longer than 5 seconds). You did not use an approved voiceprint phrase. The voiceprint phrase spoken was too short. Background noise may have been too loud. Recording volume may be too low. WHAT AUDIO CODEC ARE SUPPORTED? The recommended codec is PCM (wav RIFF) with 44.1KHz to 8KHz sample rate, 1 or 2 Channels, 48 to 8 Bits. However, the following codecs are supported: 8svx aac alac aif aifc aiff aiffc al amb au avr cdda cdr cvs cvsd cvu dat dvms f32 f4 f64 f8 fssd gsm gsrt hcom htk ima ircam la lpc lpc10 lu maud mp2 mp3 nist prc raw s1 s16 s2 s24 s3 s32 s4 s8 sb sf sl sln smp snd sndr sndt sou sox sph sw txw u1 u16 u2 u24 u3 u32 u4 u8 ub ul uw vms voc vox wav wavpcm wve xa.